Shawn Powers' areas of expertise include Linux and Chef technologies. He's earned LPIC-1 and CompTIA Linux+ certifications, and is an associate editor for Linux Journal. LPIC-2 is a certification from the Linux Professional Institute (LPI) that requires individuals to pass two exams. This course prepares learners for the second exam, Exam 202. 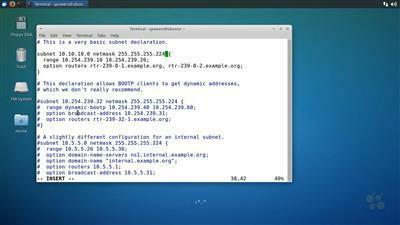 Linux supports various systems for service DNS to a local network and the Internet. In this Nugget, we learn about a few common alternatives that are mentioned in the LPIC-2 objectives. The most commonly used DNS server is BIND. In this Nugget, we learn to configure BIND in order to provide DNS caching for a local network. The BIND server can also be used for hosting the actual name resolution on a network. In this Nugget, we learn how to configure a BIND server daemon to host name resolution on a network. DNS servers are designed for redundancy. In this Nugget, we learn to configure a master and slave DNS server on two separate computers. The BIND daemon can be configured to only transfer domain information to slave servers with a shared TSIG key. In this Nugget, we learn how to configure it. With on premises servers, it's often desirable to host a split DNS setup that will resolve names differently inside the private network. In this Nugget we learn to create a split DNS setup with BIND. Running a daemon with root privileges is a security concern, because a compromised service can mean a compromised server. In this Nugget, we learn to run BIND as an unprivileged user in a chroot jail. Apache is the most commonly installed web server, and in this Nugget, we learn to install and configure it for basic web services. Apache supports many languages and modules. In this Nugget, we learn to install them, along with tweaking the Apache configuration for performance. Apache modularizes every aspect of their program, including the ability to process multiple threads at once. In this Nugget, we learn how to tweak the MPM module. Apache supports authentication for certain folders in the web hierarchy. It also supports redirecting the server to other locations in the filesystem based on client requests. Apache can support multiple websites using different IP addresses, or by sharing an IP address and using DNS names to form virtual hosts. In this Nugget, we learn to configure both. Apache can use self-signed SSL certificates in order to provide encrypted web traffic. In order to provide trusted encryption, however, a certificate signed by an SSL provider is required. In this Nugget, we learn to do both. Squid is a web caching service that allows html and graphics to be cached on the local network, so subsequent requests for those objects are served from the local system instead of redownloading from the Internet. It allows for more efficient usage of bandwidth. Limiting access to the Squid service is a way to protect the server from being used without permission. These rules can be based on many criteria, such as IP address, destination domain, etc. Authentication is a special type of ACL that requires a user to log in to access the proxy. In this Nugget, we learn to configure Squid for authenticated access. Nginx is a lightweight, extremely efficient web server. In this Nugget, we learn to install it, and learn about its configuration options. Along with serving web pages, Nginx can also act as a reverse proxy, which allows multiple machines to be accessible from a single web address, even if those services are running on ports other than port 80. The Samba suite uses multiple daemons to handle communication with Microsoft Windows networks. In this Nugget, we learn about the different daemons and their roles. In this Nugget, we learn to install and configure the Samba daemons for file sharing. The Samba (Windows) passwords are stored in a different format than the Linux passwords on the server, so must be maintained separately. In this Nugget, we learn to initialize users and keep their passwords in sync. The NFS (Network File System) server offers a simplistic, yet very efficient remote filesystem. Since it doesn't support user-based authentication, its security is often insufficient, but where appropriate, it offers the ability to mount filesystems from remote servers. DHCP can be used to provide clients IP address information from a pool of available IP addresses, eliminating the need for manually configuring systems on your network. While it's useful to have a dynamic pool of IP addresses, some systems (like servers) need to keep the same IP address all the time. DHCP allows static entries for particular machines so manual configuration isn't required, but servers get the same IP every time they start. The DHCP protocol also allows for a single machine to manage leases on multiple networks using a relay server that forwards requests. In this Nugget, we learn to do both. The Pluggable Authentication Modules (PAM) system controls how various programs on the Linux system authenticate. In this Nugget, we learn how the system works and how to modify the defaults. Individual PAM modules can be configured in order to tweak your system. In this Nugget, we learn how to configure them and see how we can enforce extra security on existing applications. The OpenLDAP server is an LDAP implementation used commonly on Linux. In this Nugget, we learn to install and configure a basic LDAP server. Manipulating an LDAP server is simple using command line tools on Linux. In this Nugget, we learn to add, delete, and modify entries in an existing LDAP database. The Postfix daemon is the most popular SMTP server for Linux, and in this Nugget, we learn to configure it for local email handling. The Postfix daemon puts all incoming email into the /var/spool/mail folder. Using Procmail for local email handling allows users to sort incoming mail based on any criteria they desire. Accessing email from a remote server is done using IMAP and POP3 protocols. In this Nugget, we learn to configure the Courier and Dovecot daemons for providing remote email access. Linux can act as a router, even one designed to protect an internal LAN by using network address translation and private IP addresses. In this Nugget, we learn what NAT is and how to configure the Linux kernel to provide the service. Along with routing packets, Linux can filter and block traffic based on several criteria. In this Nugget, we learn to use iptables in order to filter incoming and forwarded traffic. FTP Servers are useful for hosting downloadable files or for user interaction with their home directory. In this Nugget, we learn to configure several FTP servers. The secure shell daemon allows for encrypted commandline interaction with the server. In this Nugget, we learn to configure various options on the SSH server. SSH Keys add a layer of security to the secure shell system by ensuring the users connecting and the servers they are connecting to are who they claim to be (SSH aims to prevent man-in-the-middle attacks). In this Nugget, we learn to use SSH keys. Linux includes tools for detecting and preventing security issues on your server. In this Nugget, we learn how to test our security and help prevent unwanted attacks. OpenVPN provides point-to-point or site-to-site encrypted connections. In this Nugget, we learn to configure OpenVPN.